Bacon Wrapped Asparagus is an easy and delicious side dish that is ready in 30 minutes. Wrapping this elegant veggie with bacon is pretty much everyone’s favorite way. This dish can be enjoyed as an appetizer for a party, side dish or dinner. Even if you are not a huge fan of asparagus, give it a try, it’s quite flavorful! Watch recipe video below. We’ve been making this recipe for years, and if you love bacon wrapped things, then this is the best dish you can get! 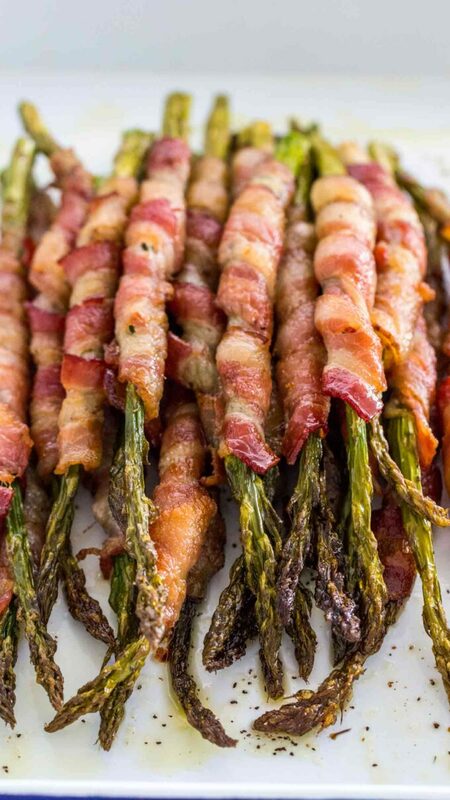 Asparagus is delicious on its own, but when you add bacon to it, it is totally amazing! You can serve it as is or as a side dish to meatloaf, slow cooker ribs, or oven baked chicken breasts. 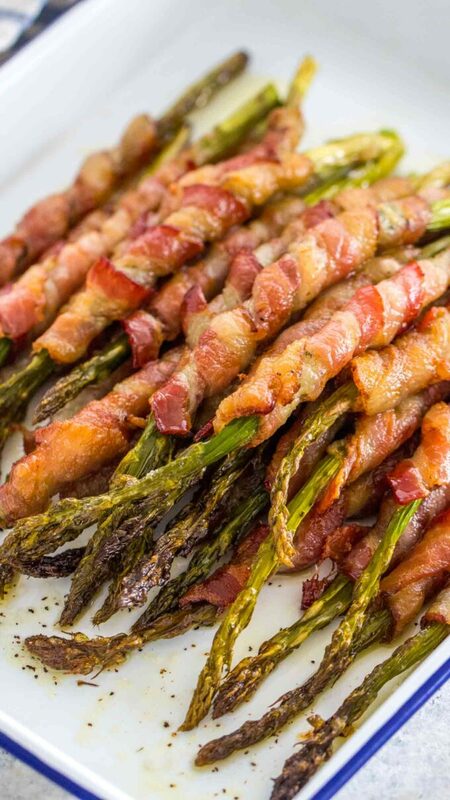 Bacon Wrapped Asparagus is the perfect combination of both worlds. You have one of the most delicious veggies paired with bacon, making it irresistible. This is our favorite way to prepare the asparagus. The key to making the bacon crispy is to allow some air flow when baking. It is important not to overcrowd the pan when cooking, and to place them on a rack when in the oven. This will result in a perfectly cooked veggie with a crispy outside. Also, this is such an easy recipe to make and is perfect to be served for a larger crowd. We use regular cut bacon as the thick-cut version takes a lot longer to cook, which might result in overcooking the veggie. If you want to go with the thick-cut version, we recommend using larger stalks as they require longer cooking time. Bake them for 20 minutes then sprinkle with some black pepper for a quick and flavorful meal. 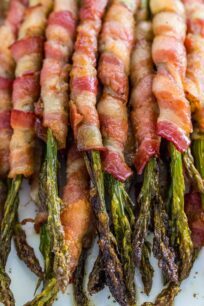 How to make Bacon wrapped asparagus? We try using medium-sized stalks as they work best here. Thicker stalks tend to cook longer time and make the bacon too crisp and dry, and thin stalks may get mushy by the time the bacon cooks through. Then, wrap it in a pinstripe pattern around the veggies. Try to keep the bacon strip not to overlap. This will help create more airflow around it, resulting in perfectly crispy bacon. Place individually wrapped veggies on the wire rack. Baking it this way will allow the air to flow, resulting in uniformly cooked asparagus and crispy dish. Following these steps will ensure the best side dish possible. For ultimate results, we always cook this dish at 400 degrees F. This is the perfect temperature for the bacon to get crispy and asparagus to roast nicely. It requires about 15 to 20 minutes of cooking time. We recommend starting checking on it after the 15-minute mark. 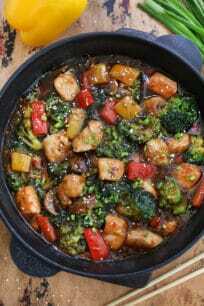 As the size of veggies varies, it’s best to keep this under control not to overcook it. Roasting it as is also a great and healthy option. It is very easy and requires 2 minutes of preparation time. We already have a delicious roasted in olive oil recipe for it, and you can check it out by following this link. This recipe works great with prosciutto as well. Simply wrap it around and follow the same steps as above. Also, you can bundle a few pieces together and then wrap them. It has a nice presentation to it as well. For a sweet and savory taste, coat it with some brown sugar or maple syrup on top prior to baking. To grill this dish, follow the same steps and grill for about 10-15 minutes. For an even crispier texture, place the asparagus under the broiler for about 2 minutes in the end. Similarly, you could cut the asparagus in half to make shorter appetizers. Bacon Wrapped Asparagus is an easy and delicious side dish that is ready in 30 minutes. Wrapping this elegant veggie with bacon is pretty much everyone's favorite way. Place a wire rack inside a rimmed baking sheet. Trim the ends of the asparagus by about 1 inch. Add them to a large bowl and drizzle with salt, pepper and olive oil. Coat well. If desired add some smoked paprika and garlic powder for extra flavor. Cut the bacon slices lengthwise and wrap each asparagus piece in a bacon strip. Wrap it tightly around the veggie stalk, slightly overlapping to create a spiral pattern. Place seam side down onto the prepared wire rack. 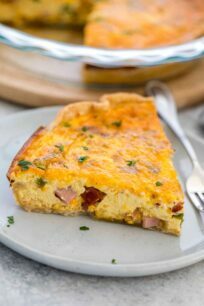 Bake for 10 minutes in the preheated oven and using kitchen tongs turn over and bake for 10-15 more minutes, or until the bacon is nicely cooked and crispy. Broil for 1-2 minutes, careful not to burn. Mix brown sugar and maple syrup and brush onto the prepared wrapped stalks before baking. A fun way to encourage your family to eat their veggies! Looks great! I love Bacon! Wrapping them around my favorite vegetable, mind-blown! Making these tonight! Bacon wrapped anything is an instant winner in my family. I know my husband would love this! I can’t wait to make it! 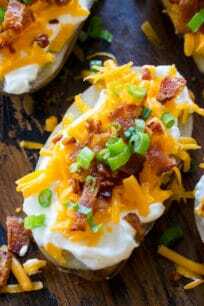 What a great low carb appetizer for the big game! 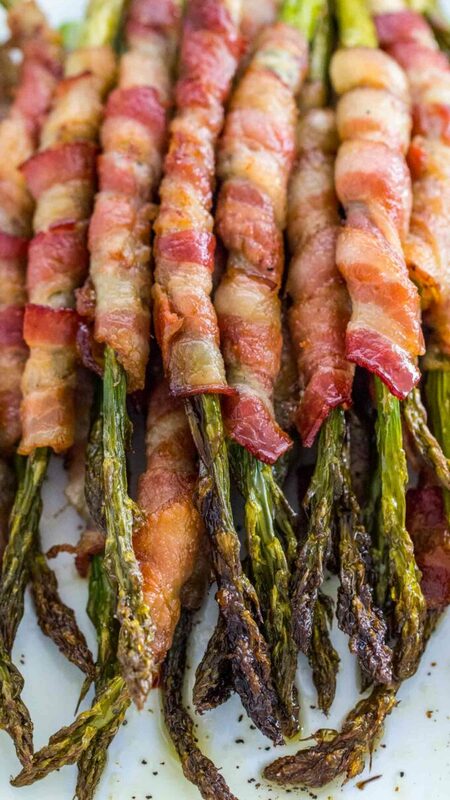 I love bacon and asparagus together and this is a great way to serve it up as an app rather than a side dish. This looks really amazing! This will be a sure hit at my house!